THE ACNE GROUP is dedicated to providing accurate, reliable information on the treatment of acne, acne skin care and eliminating acne. Believe it or not, acne IS a skin disorder! Everyone seems to have acne and everyone seems to suffer from it. 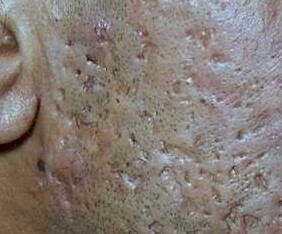 1) Abnormal blocking of the sweat and hair follicle caused by too much androgen production in teenagers and by stress in those with adult acne. 2) A greater production of oil by the sebaceous glands. 3)And the abundance of common bacteria that all humans have. 1)Rosacea: Acne and rosacea are two unrelated skin conditions. However, the two do co-exist together on the patients skin just as acne and psoriasis or acne and eczema and many other skin conditions that also appear together. Adult acne and rosacea are often seen on approximately 80% of patients and varies from mild to severe acne. Rosacea and acne are quite different as rosacea is a red face in the mild forms and has many stages. 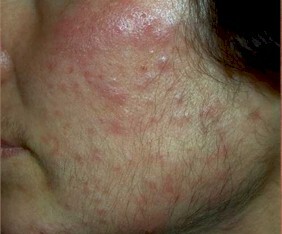 However, acne is red pus filled bumps that vary from mild to severe. Clogged skin pores and bacterial infections cause acne. The blackheads, whiteheads and pimples are all different forms of acne and sometimes appear with rosacea or combined skin disorders appearing at the same time. Rosacea consists of red bumps called papules. The papules and pustules that occur in rosacea may look like typical acne, but closer observation by a trained physician reveals the absence of whiteheads and blackheads. In rosacea, the pimples and cysts rarely appear on the chest and back. 2)Seborrheic Dermatitis: Seborrheic dermatitis is very painful sensitive skin when on the face. When it is on the scalp it is called dandruff and had little or no pain as the scalp has very few pain sensors or nerve endings. Many people bump their heads for years with very little problem. Seborrheic dermatitis is an itch red area on the facial skin and on other places of the body. Most often, seborrheic dermatitis is on the facial area along with rosacea. It involves overactive sebaceous glands and scaly flaky skin. Whereas, the scaling skin on the eyelids of ocular rosacea. is sometimes confused with it. 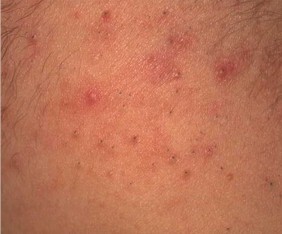 Look further into the Acne Group for more information on acne, acne treatments, the cause of acne, etc. Did you know that many acne sufferers are also affected by rosacea? Quite often due to the very aggressive skin medications to exfoliate the blocked oil pores, the skin becomes very red and irritated. Rosacea and acne is caused by an acidic body and skin, and the primary symptom is a red face. The Rosacea-Ltd III web site has more information on rosacea. Wash your skin with a mild cleanser, at least once in the morning and once in the evening and after heavy exercise. Wash your face from under the jaw to the hairline. Some people with acne may try to stop outbreaks and oil production by scrubbing their skin and using strong detergent soaps and rough scrub pads. However, scrubbing will not improve acne; in fact, it can make the problem worse. It is important that you thoroughly rinse your skin after washing. Astringents are not recommended, instead use a clean wash cloth to gently exfoliate the skin and open the pores. Dermatologists also recommend that patients regularly shampoo their hair. Those with oily hair may want to shampoo it every day.